Right on, Mary. Right on. In my world, perfection was always the prize. Perfect daughter. Perfect friend. Perfect student. Perfect date. Perfect employee. Perfect-a-mundo. When I was 23 years old, my perfect little world fell apart. My Dad was dying and quite frankly, so was I. Not physically, but emotionally. My family of Dad, Mom, and I were threatened by a cancer with an uncontrollable outcome. So, consciously or not, I chose to control the only thing that I could. And that was reflected in my eating. I went from a lover of cheeseburgers and fries to a lover of salads. Sounds healthy, right? Well, that full salad went to a half salad that went to “I’ll just have a bite or two, I’m full” salad. As my body changed to reflect that, I translated the concerned comments of “You’ve lost a lot of weight…” to mean “Wow, keep up the good work!” You see, I controlled the way I heard their words and interpreted them into what I wanted to hear. ​Looking back now, I realize that the bags of groceries my folks sent home with me reflected their desperate desire to help. My well-meaning friends would invite me for pizza parties or late night ice cream runs…but I never went. ​I wasn’t healthy and neither was my heart. It fluttered. It hurt. It felt weak, tired, less than perfect. ​During this time, I didn’t talk to God much. Oh, I grew up in the church. I knew Jesus as my personal Savior. But, I had stepped into a period of darkness that I chose to control. Honestly, I’m not sure why. Was I mad at God because my Dad was dying? Only He knows for sure. Yet, although my prayers were few, the love of my Heavenly Father for me was fierce. He carried me when I didn’t even know it. And He ultimately brought me to an unlikely place where my need to be perfect received a reality check. I had always enjoyed a bookstore, so it’s no surprise that I went inside. But, I wasn’t prepared for the magazine cover that changed everything. The headline announcing the death of a famous singer read something like this: Dead at 33. Heart Failure caused by Anorexia Nervosa. I picked it up and started reading. Her story and her symptoms mirrored mine. At that moment, I felt a wave of fear cover me. Not the fear of living, but the fear of dying. And I immediately let go of my control and all things perfection and cried out in my soul with desperation. I wish I could tell you that I went back home that day and ate a three course meal with dessert. But I can’t. It took time for my body and my spirit to heal. It took the intentional letting go of me to the only One who could set me free. What about you, friend? Do you wrestle with the need to be practically perfect in every way? Are you fearful about letting go of control and letting God direct your steps? Dear one, whatever you fear today, God is bigger. He made you one of a kind and loves you just the way you are. 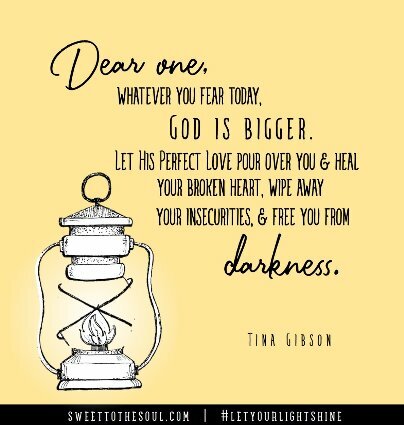 Let His Perfect Love pour over you and heal your broken heart, wipe away your insecurities, and free you from darkness. ​I still have moments where I try to be “practically perfect in every way”. But, I don’t linger there. Instead, I choose the light instead of the darkness and remind myself that I am enough…that He is enough. Father God, Thanks for loving us, not because we are perfect, but because You are perfect. Hold us close and fill us your peace and hope today. In Jesus’ Name, Amen. Tina Savant Gibson has always loved words. Her sweet mom would happily proclaim “She could talk before she could walk!” After a successful career in marketing, Tina has come full circle. Her heart is overflowing with life stories. 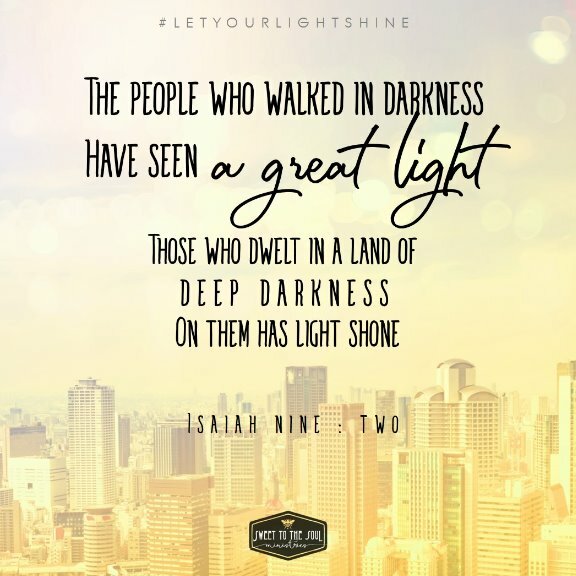 Tina’s joy is to shine for Jesus and share His amazing grace with others. Tina loves taking pictures of the sky, encouraging another soul, and dancing in the living room with her husband, Frank, who inspires her more than he’ll ever know.